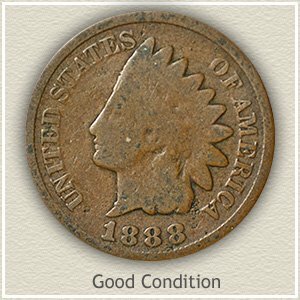 High 1896 Indian head penny value is the result of collector demand exceeding the small number of nice condition coins surviving today. If your coin is above average in condition the value doubles. Saved over the years, many of these old pennies minted after 1888 are available but mostly in very worn condition. What is uncommon about the 1896 Indian penny is finding one with most of the design remaining. Looking closely at your coin, if you can recognize a ribbon across her hair just below the ear, detail to the headband and separate beads to the necklace your coin is sought after by collectors. Rare is a coin in its original condition, never used. An example is pictured to the right. Termed "uncirculated" by hobbyist this 1896 Indian penny is worth in the range of $40 to $50. An important and deciding factor to 1896 Indian penny value is your coin’s condition. 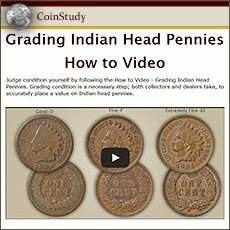 Just after the value chart, grading your Indian penny is studied with images and descriptions. 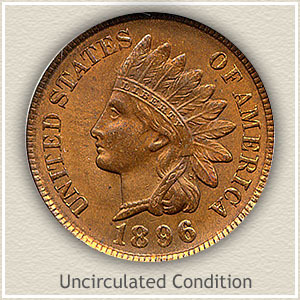 Pictured is one of the top condition 1896 Indian pennies known. Setting it apart is the original color and luster. Copper, quick to begin toning, shows no evidence of loosing any brightness here. Adding to the rarity is a very bold strike with fine details extending to the tips of the feathers. Next of concern to collectors are marks and abrasions to the surface. This coin has been spared any contact leaving the portrait and fields clear of distracting marks. Combine now luster, strike and mark free surfaces into one 1896 penny and you have a rare occurrence. David Lawrence rare coin auctions sold this coin to strong bidding for $540. 1896 Indian head penny value is firmly above $500 in the gem quality level of condition. Relating to an old Indian penny it is the small details that decide the value of your coin. Once a coin entered circulation the process of wearing away the finer parts of the design began. The extent of this wear is judged and a "grade" is assigned. 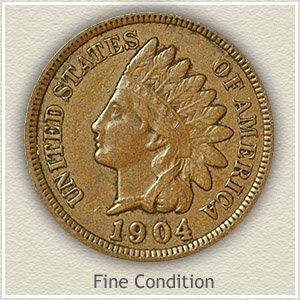 Follow the images and description to find an accurate value of your 1896 Indian penny. Uncirculated: Desirable because no wear is affecting the surfaces. This penny despite its age is in like new condition. Toning may appear as a dark redness and brown coloring, however no parts of the design have been worn from contact. With a magnifying glass examine her cheek and the tips of the feathers for wear. Minting imparts a certain grain to the surfaces of coins, wear can appear as a somewhat glossy or smooth area and sometimes with dullness to the area. Extremely Fine: Sharply defined details, including the minor elements, defines an Indian penny in "extremely fine" condition. Within the head band the letters in Liberty are fully separated from the defining lines of the band. An obvious ribbon is crossing her hair just above the neck line. Wear is present, however all parts are bold. Your coin should stand out as very pleasing to the eye and highly detailed. Fine: Separation of the major design elements is visible on 1896 Indian pennies in "fine" condition. The worn surfaces are evident but roundness defines the forehead from the eye and cheek. In the area close to the headband the quill and inner parts of the feathers are beginning to show details. Only the high profile ends of the feathers are worn lacking any design. Hair curls are recognizable behind the neck. Moderately worn old pennies are collectible, 1896 Indian head penny value is usually double a lesser grade coin. A very popular coin, everyone understands and has heard of the value of an Indian Head penny. Common dates are now worth one dollar each. Many collectors are building collections and putting a heavy demand on the rare dates and better condition coins. 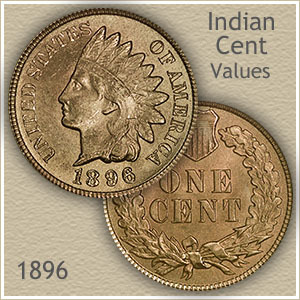 Find not only your 1896 Indian head penny value but all dates in the series are listed on the chart.